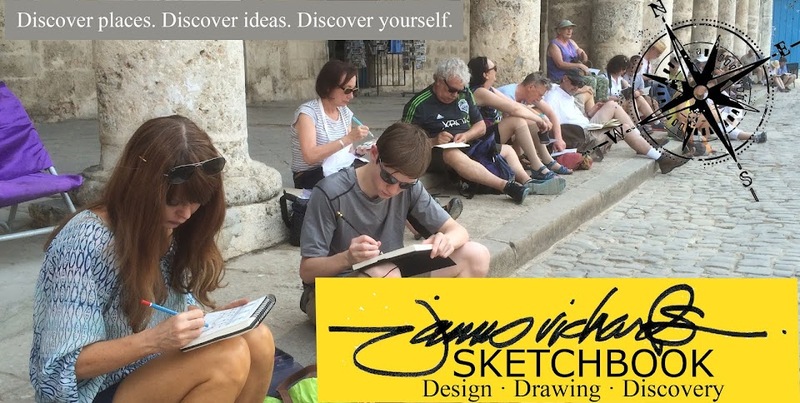 James Richards Sketchbook: Workshops for Washington State University! I'm very happy to have the opportunity to give a public lecture, a gallery exhibition and a series of design sketching workshops March 31-April 3 at the invitation of Washington State University's Landscape Architecture Program. These aren't public workshops, but rather a chance to interact with young design students in small groups, teaching techniques for rapid visualization of ideas. As we often do, Patti and I will extend our time in the area with a road trip, this time through the Mountain West to explore the region's towns, majestic landscapes and national parks. Ketchum, Idaho, another key setting in my continuing journey tracing Ernest Hemingway's footsteps around the globe, will also be on the itinerary. High adventure indeed! I wish you'd come and do that in Paris. Oh my! I'd love to do that! Perhaps we can coordinate something in the future. I was in Paris in November, but only for one day.